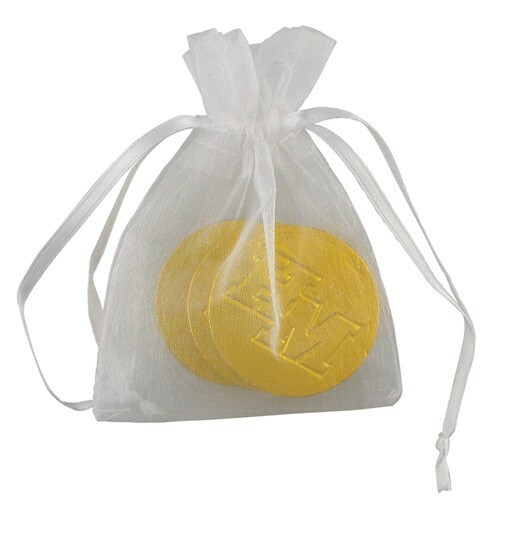 Organza bag filled with 3 delicious 0.22oz chocolate candy coins debossed with a custom or stock message. Available in your choice of foil color: Gold, Red, or Blue. Milk chocolate candy available in all colors. Makes a great food gift or promotion. Available in: Milk Chocolate Only. Coins available in blue, red or gold. Organza bags available in a variety of colors. Call factory.